ENC likes to provide the opportunity for up and coming investigators to showcase their research, and today’s post comes from a student of Jamie I. Baum, PhD, Assistant Professor of Nutrition at the University of Arkansas. Brianna L. Neumann graduated from Truman State University with a bachelor of science in Exercise Science. Her undergraduate research experience involved sports nutritional research, which began her desire to continue her education to focus on protein’s metabolic effect in the body. She currently is a Master’s student at the University of Arkansas in the Department of Food Science, where her research specifically focuses on the impact protein quality and quantity on whole body energy metabolism. In today’s society, big muscles are associated with weight lifting, men and sports. However, for most people, the benefits of gaining muscle mass include improvement in gross motor skills and a potential decrease in sarcopenia (gradual age-related loss in muscle mass and function). When discussing the building of muscle mass, a term you need to be familiar with is muscle protein synthesis (MPS). In general, in order to gain muscle mass, you need to synthesize more muscle than your body is breaking down. Through extensive research on muscle mass, it is known that an outside stimulus, such as resistance exercise, is required for building muscle. More recently, it has been discovered that nutrition, specifically in the form of protein, also plays a vital role in the physiology of this process5, 6. 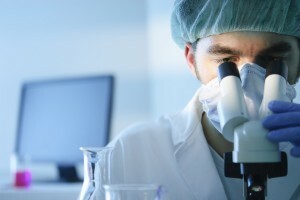 Research has shown that consumption of high-quality proteins (e.g. beef; eggs) can stimulate MPS in both young and elderly individuals, following a meal8, and this effect may be attributed particularly to the quality – not just the quantity – of the protein. 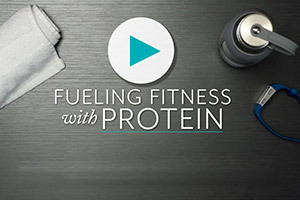 High-quality proteins tend to be from animal sources and include eggs, poultry, beef and dairy, which are high in essential amino acids (EAA), particularly the branched-chain amino acid leucine. Data show that leucine promotes MPS at a greater rate than that of the other EAA due to leucine’s ability to activate the mammalian target of rapamycin (mTOR), the key regulatory pathway in MPS1, 3. A recent study clearly demonstrates the relationship between EAA and MPS. Eight individuals were given 10 grams of EAA on two separate occasions and a dose of rapamycin (an inhibitor of mTOR) on one occasion, which led to a 60% increase in MPS following ingestion of EAA. However, this effect was completely blocked when subjects were treated with rapamycin4. In addition, another study tested 8 healthy, sedentary older adults with diets supplemented by leucine for 2 weeks (4 grams per meal) and found a significant increase in muscle fractional synthesis rate at the end of the treatment period4. The muscle fractional synthesis rate is the fraction of the proteins that are synthesized in the muscle per unit of time9. Resistance exercise can also increase MPS and add “bulk,” or increase muscle mass. There are two primary principles of exercise that need to occur in order for someone to successfully add “bulk”: progression and overload. The most important for MPS is overload, defined as placing additional stress on a muscle above normal conditions, and includes exercises such as weight lifting and swimming. Therefore, in order for someone to “bulk up,” they must have an outside stimulus that serves to initiate MPS inside the body. There are various ways to achieve overload such as adding more weight or increasing a swimming distance, and research is still being done regarding how to maximize MPS. A recent study examined the effect of concentric resistance exercise on 8 trained men2 to determine if muscle building signaling enzymes were progressively increased as more sets of resistance activity were performed. The investigators concluded that performing additional sets showed a greater increase in MPS than just a single set of lifts. Is there an additive effect of protein ingestion and resistance exercise? As stated above, both exercise and nutrition initiate MPS, and ideally, one would have both in order to maximize muscle building within the body. For example, the effect of beef ingestion coupled with resistance exercise was recently tested in 35 middle-aged men who consumed one of four different amounts of beef (0, 57, 113 and 170 grams) prior to resistance exercise (unilateral movements). Results of this study demonstrated that eating 170 grams of beef in addition to exercise significantly elevated MPS when compared to the other groups7. In summary, MPS is complex and can be influenced by both nutrition and exercise. Both can activate MPS individually, but research shows combining the two is best to promote MPS. Further research is still needed to understand the long-term impact of this combination, as well as the practicality of dietary intake for individuals in order to maintain and increase muscle tissue. Anthony JC, Yoshizawa F, Anthony TG, Vary TC, Jefferson LS, Kimball SR. Leucine stimulates translation initiation in skeletal muscle of postabsorptive rats via rapamycin sensitive pathway. Journal of Nutrition. 2000; 130(10): 2413-9. Burd NA. Holwerda AM, Selby KC, West DW, Staples AW, Caine NE, Cashaback JG, Potvin JR, Baker SK, Phillips SM. Resistance exercise volume affects myofibrillar protein synthesis and anabolic signaling molecule phosphorylation in young men. Journal of Physiology. 2010; 588(Pt 16): 3119-30. 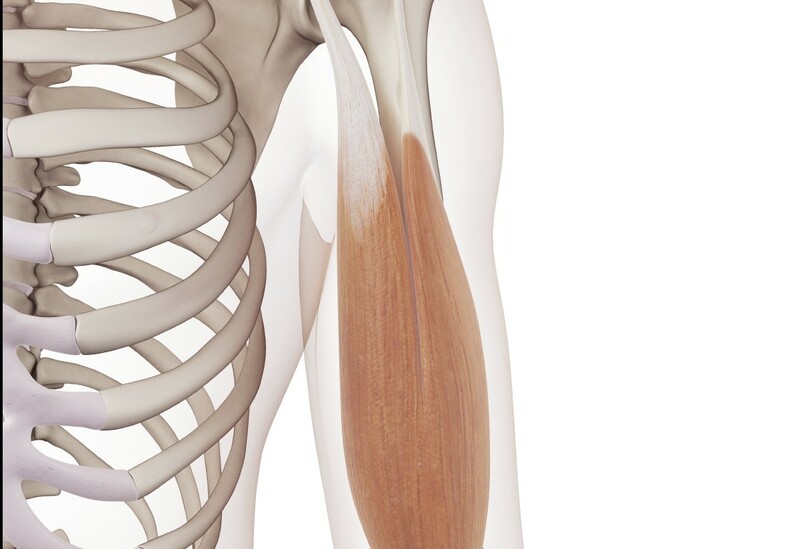 Caperson SL, Shelffield-Moore M, Hewlings SJ, Paddon-Jones D. Leucine supplemenatation chronically improves muscle protein synthesis in older adults consuming the RDA for protein.Clinical Nutrition. 2012; 31(4): 512-519. Dickson JM, Fry CS, Drummond MJ, Gundermann DM, Walker DK, Glynn EL, Timmerman KL, Dhanani S, Volpi E, Rasmussen BB. Mammalian target of rapamycin complex 1 activation is required for the stimulation of human skeletal muscle protein synthesis by essential amino acids.The Journal of Nutrition. 2011; 141(5): 856-62. Drummond MJ, Rasmussen BB. Leucine-enriched nutrients and the regulation of mammalian target of rapamycin signaling and human skeletal muscle protein synthesis. Current Opinion in Clinical Nutrition and Metabolic Care. 2008; 11(3): 222-6. 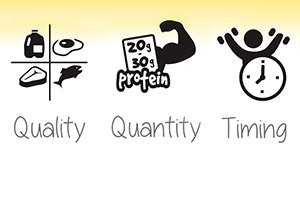 Millward DJ, Layman DK, Tomé D, Schaafsma G. Protein quality assessment: impact of expanding understanding of protein and amino acid needs for optimal health. American Journal of Clinical Nutrition. 2008; 87 (5): 1576S-1581S. Robinson MJ, Burd NA, Breen L, Rerecich T, Yang Y, Hector AJ, Baker SK, Phillips SM. Does-dependent responses of myofibrillar protein synthesis with beef ingestion are enhanced with resistance exercise in middle-aged men. Applied Physiology, Nutrition, and Metabolism. 2013; 38 (2): 120-5. Symons TB, Sheffield-Moore M, Wolfe RR, Paddon-Jones D. A moderate serving of high quality protein maximally stimulates skeletal muscle protein synthesis in young and elderly subjects.Journal of American Dietetics Association. 2009; 109(9):1582-6. Wolfe RR. Skeletal muscle protein metabolism and resistance exercise. 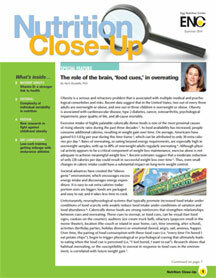 The Journal of Nutrition. 2006; 136(2): 525S-528S. Protein is a critically important fuel source for muscles, and branched chain amino acids (BCAAs) are particularly so. Leucine is the most abundant BCAA found in muscles, and as the body of leucine research continues to grow, so does the evidence pointing to several benefits that leucine imparts, including the regulation of skeletal muscle protein synthesis. This was demonstrated in a study where leucine supplementation in a low dose of whey protein stimulated postprandial human myofibrillar protein synthesis as effectively as a much greater dose of whey protein (1). Similarly, a low-protein mixed macronutrient beverage supplemented with a high amount of leucine was found to be as effective as a high-protein beverage at stimulating muscle anabolism (2). Furthermore, results of another study on muscle recovery suggest that increasing the concentration of leucine in an essential amino acid supplement during moderate intensity exercise may increase post-exercise skeletal muscle metabolism (3). In addition to tissue protein synthesis, leucine in combination with vitamin B6 also increased fat oxidation and insulin sensitivity and reduced oxidative and inflammatory stress, thus suggesting a potential approach in the management of obesity (4). 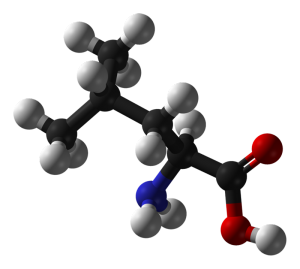 Leucine is an essential amino acid, and as such, it must be obtained from dietary sources, since our bodies cannot produce it. Animal proteins in general are among the best sources of dietary leucine. Eggs contain 1.086g of leucine per 100g weight, which translates to approximately 9% of its total protein content (5). When compared to other foods commonly consumed for breakfast, eggs are not as high on a gram for gram basis as oats or cheese (see figure below). 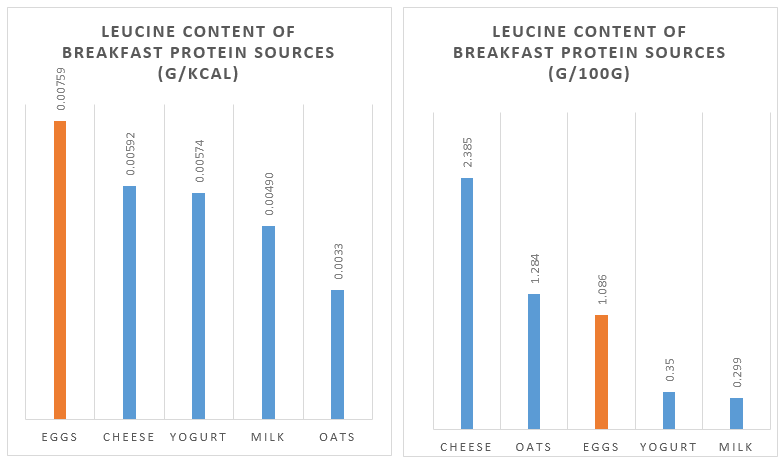 However, when a comparison of leucine content is made on a per calorie basis, eggs come out looking better than most other common food sources. At only 72 calories, with 6.3 grams of protein and a high leucine content, eggs are a nutritionally- and protein-dense food source, perfect for those trying to get a little more protein, leucine and other essential micronutrients in their diets. As noted in the dialogue from the recent fourth meeting of the Dietary Guidelines Advisory Committee, protein is notoriously under-consumed at breakfast. 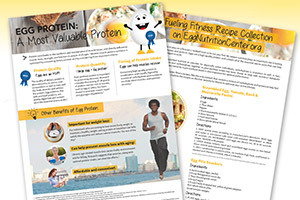 Given their robust nutrient profile and leucine content, eggs can be an easy fix to this nutritional shortcoming and an important protein source to consider when helping patients and clients build healthful diets. Churchward-Venne TA, Burd NA, Mitchell CJ, West DW, Philp A, Marcotte GR, Baker SK, Baar K, Phillips SM. Supplementation of a suboptimal protein dose with leucine or essential amino acids: effects on myofibrillar protein synthesis at rest and following resistance exercise in men. J Physiol. 20012; 590(Pt 11):2751-65. Churchward TA, Breen L, Di Donato DM, Hector AJ, Mitchell CJ, Moore DR, Stellingwerff T, Breuille D, Offord EA, Baker SK, Phillips SM. Leucine supplementation of a low-protein mixed macronutrient beverage enhances myofibrillar protein synthesis in young men: a double-blind, randomized trial.Am J Clin Nutr. 2014; 99(2):276-86. Pasiakos SM, MClung HL, McClung JP, Margolis LM, Andersen NE, Cloutier GJ, Pikosky MA, Rood JC, Fielding RA, Young AJ. Leucine-enriched essential amino acid supplementation during moderate steady state exercise enhances postexercise muscle protein synthesis. Am J Clin Nutr. 2011; 94(3):809-18. Zemel MB, Bruckbauer A. Effects of a leucine and pyridoxine-containing nutraceutical on fat oxidation, and oxidative and inflammatory stress in overweight and obese subjects. Nutrients. 2012; 4(6):529-41. USDA National Nutrient Database for Standard Reference. U.S. Department of Agriculture, Agricultural Research Service, USDA Nutrient Data Laboratory Website. Updated Dec 7, 2011.http://ndb.nal.usda.gov/. Accessed July 28, 2014. Today’s post comes from guest blogger, Apeksha Gulvady, PhD. Apeksha holds an MA and PhD in Nutritional Sciences from the University of Texas in Austin, where her research focused on the role of aging and diet-induced obesity on immune cell function. Apeksha previously worked with PepsiCo R&D, where she supported core nutrition business activities and priorities in both global foods and beverages, and she has recently joined Edelman Public Relations to pursue her passion for nutrition communications. The 2015 Dietary Guidelines Advisory Committee (DGAC), consisting of nationally recognized experts in the field of nutrition and health, recently reviewed the latest in nutrition research in pursuit of developing evidence-based recommendations for the next edition of the Dietary Guidelines for Americans. The overarching goal of these new recommendations is to encourage Americans to eat a well-balanced diet to help achieve and maintain a healthy weight, promote health and prevent disease. The DGAC’s fourth meeting, held July 17-18, commenced with an introduction by DGAC Chair, Barbara Millen, who underscored the broad scope of work the Committee has undertaken and the Committee’s three core themes: 1) Dietary Patterns; 2) “What works” to help people actually implement the Dietary Guidelines; and 3) a Systems Approach focusing on what, where and how people consume food and exercise. Subcommittee 1 on food and nutrient Intakes, and health: current status and trends found that there are multiple ways to build a healthful diet, and it can be done by way of the current food supply. The challenge then becomes, how to make these diets accessible to people and inspire them to make healthier choices. 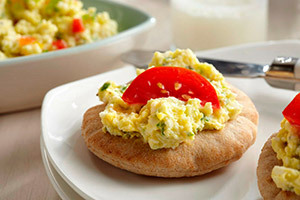 During the discussion, Wayne Campbell stated that proteins are notoriously under-consumed at breakfast, and Barbara Millen agreed, calling out eggs as an important protein source to consider. Subcommittee 2 on dietary patterns, foods and nutrients, and health outcomes presented a review of evidence on dietary patterns associated with reduced risk for the development of cardiovascular disease, type 2 diabetes, overweight/ obesity and cancer. Overall, they observed that “common dietary patterns confer benefits across a variety of outcomes.” During the Committee’s discussion about the need for more specificity regarding individual foods and amounts within these dietary patterns (e.g. lean red meat vs. chicken vs. fish; low-fat vs full-fat dairy; refined grains and added sugars), a Committee member mentioned research indicating that dietary patterns associated with favorable outcomes related to body weight and reduction of CVD risk include low intakes of cholesterol, among other nutrients. This prompted Miriam Nelson, to challenge whether it was cholesterol itself or rather food sources of cholesterol that were related to observed health risks. Frank Hu clarified that observed health outcomes were attributed to dietary patterns rather than individual effects of cholesterol or any single nutrient. Subcommittee 3 on diet and physical activity behavior change examined emerging areas of research including acculturation, eating out and mobile technology as it relates to health behavior change strategies. Overall, these areas had very limited research available, and more research is needed. Subcommittee 4 on food and physical activity environments presented updates in three areas: food access, early childhood and school environment. Overall, they found limited evidence in these areas and that more research needs to be explored. Also, initial conclusions within additional areas of exploration are yet to come at future meetings. Findings of Subcommittee 5 on food sustainability and safety were similar to the dietary patterns associated with positive health outcomes presented by Subcommittee 2 (e.g. Mediterranean, vegetarian, etc.). The Committee found that in general, a dietary pattern that is lower in animal-based foods and higher in plant-based foods has lesser environmental impact. The physical activity writing group lead by Miriam Nelson stated that the DGAC will include physical activity recommendations for various age groups, based on recommendations from the 2008 Physical Activity Guidelines for Americans. 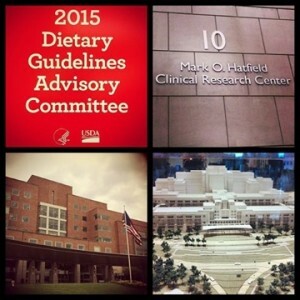 While this fourth meeting of the DGAC indicated the directions that the 2015 Dietary Guidelines for Americans may take, it is clear that more research is needed in each focus area, and final determinations and recommendations for all topics under the Committee’s broad scope are as of yet undecided. With multiple meetings and opportunities for public and private entities to provide feedback and comments, the 2015 Dietary Guidelines for Americans remains a work in progress, and the ongoing dialogue of the DGAC will become increasingly important for health professionals to monitor. Obesity is a serious and refractory problem that is associated with multiple medical and psychological comorbities and risks. Recent data suggest that in the United States, two out of every three adults are overweight or obese, and one out of three children is overweight or obese. Obesity is associated with cardiovascular disease, type 2 diabetes, cancer, osteoarthritis, psychological impairment, poor quality of life, and all-cause mortality. and/or osteoporosis later in life, which affects approximately 54 million Americans over the age of 50 years 2, is highly linked to suboptimal nutrition and physical activity patterns during young adulthood. After the age of 20-25 years, when bone growth reaches its full genetic potential, bone “withdrawals” can begin to exceed “deposits” (except in the skull, which increases in mass throughout the lifespan). student underwent some basic blood tests and we compared results across the class. For some tests (e.g., liver enzymes), there was little variability among the students. But in others, there was quite a bit of diversity in results. For example, the blood glucose and insulin responses to an oral glucose tolerance test varied dramatically student to student. The prevalence of obesity in the United States has more than doubled in adults and more than tripled in children and adolescents since the 1970s. Roughly one in three children ages 2-19 years is overweight or obese. Obese individuals have an increased risk of developing type 2 diabetes mellitus (T2DM), hypertension, and dyslipidemia. Once restricted to adults, these metabolic diseases are now being diagnosed in children. Increasing protein in the diet has been linked to improvements in glucose and insulin control, blood cholesterol, body composition, energy metabolism, as well as increased weight loss in adults. However, very little research has been focused on determining if increasing protein in the diet of school-aged children has comparable health benefits. Training low” has nothing to do with altitude and everything to do with intentionally training with low glycogen stores to enhance fat metabolism. It is the latest craze for endurance athletes who seek to preserve glycogen stores by optimizing utilization of fat stores through an adaptive process during their training. This is typically accomplished by lowering carb feed rates to <3 g / kg / d for five days or more 1. Fat intake is increased to compensate for lower carb calories with the idea that intramuscular triglyceride stores go up along with enzymes necessary for fat oxidation. ENC has partnered with Academy of Nutrition and Dietetics’ SCAN (Sports, Cardiovascular, and Wellness Nutrition) Dietary Practice Group to offer a continuing education webinar titled Building an “Optimal Diet”: Putting Protein into Practice, presented by Dr. Stuart Phillips. 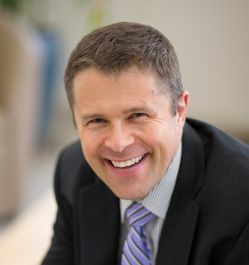 Dr. Phillips is a professor at McMaster University and one of the leading investigators in the field of exercise metabolism. His work focuses on the impact of nutrition and exercise on human skeletal muscle protein turnover. During the webinar, he discusses protein needs and timing of intake for maximum muscle growth and maintenance for athletes and the aging population. Additionally, he elaborates on how protein quality plays a major role in muscle anabolism. To close his talk, Dr. Phillips shares suggestions for practical applications of the latest protein research, including recommending natural protein sources with high biological value, such as eggs and milk, to help health professionals to make up-to-date diet recommendations to their clients and patients. The webinar is approved by the Commission on Dietetic Registration (CDR) for 1 CPEU and is free of charge throughout the month of July. To receive the CPEU, SCAN members and non-members must log into the SCAN website to order and view the webinar.